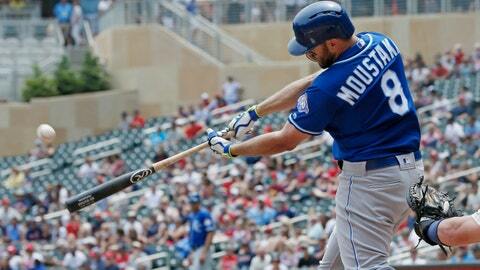 Mike Moustakas hits the first of his two solo home runs against the Twins. MINNEAPOLIS — If this is Brian Dozier’s last month with the Minnesota Twins, it’s off to a strong start. Whether he is helping boost the Twins back into the division race or merely increasing his trade value, Dozier has found his form at the plate. Dozier hit a two-run homer, going deep for the second straight game to help the Twins beat the Kansas City Royals 8-5 on Wednesday. Lance Lynn (7-7) recovered from a three-run homer by Salvador Perez in the first inning to win his second straight start for the Twins, who used the bottom third of their lineup to launch rallies in the second and the fourth against Burch Smith (0-1). Dozier drove in a run with an infield single in the fourth. Then he sent his 15th homer of the season into the second deck above left field in the sixth inning against Enny Romero. Logan Morrison hit a solo shot one out later to pad the lead for Minnesota, which improved to 6-1 on an 11-game homestand. With the Twins trailing AL Central-leading Cleveland by 8 1/2 games when the day began, Dozier is among several prominent players on expiring contracts whose names are part of the annual July trade market speculation. Lynn is one of those, too. Only first baseman Joe Mauer has that. “So everyone else can just wear it and do what they’re told,” Lynn said. Mike Moustakas homered twice for the Royals, who took the Twins deep five times over the last two games of this series despite toting the fewest home runs in the major leagues. Kansas City has lost 23 of its past 27 games. Dozier’s production at the plate is lower than it has been in at least five years, but he has started to warm up with a .375 batting average, three homers and eight RBIs over his past six games. Only four of his home runs have come at home this season. He hit 127 homers over the previous four years, with 63 of those at Target Field. “You just ride the wave. Sometimes they find the green grass, sometimes they find the seats, sometimes you’re walking back with your head down,” he said. After 24 relief appearances this year, Smith made his first major league start since 2013, when he was with San Diego. Forearm and elbow injuries kept him from pitching in 2015 and 2016, and he spent last season with the Tampa Bay organization. Royals: RHP Jason Adam was recalled from Triple-A Omaha to take the spot of a discouraged RHP Ian Kennedy, who returned to the disabled list with a strained left oblique after an injury-shortened three-inning start Tuesday night. Adam had been sent down the day before so that Kennedy, who has gone 16 turns without a victory, could be reinstated. Twins: RHP Addison Reed was placed on the DL with tightness in his right triceps, and RHP Alan Busenitz was recalled from Triple-A Rochester for the third time this season. … INF Ehire Adrianza is on track to come off the DL on Thursday after missing 10 games with a strained left hamstring.